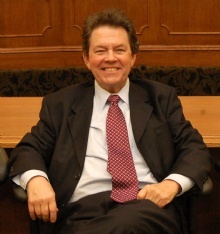 Arthur Laffer (born as Arthur Betz Laffer in Youngstown, Ohio) is a famous Economist from USA, he is 78 years old and still alive, born August 14, 1940. Arthur Betz Laffer Sr. is an American economist. His most famous contribution to economics discourse is the Laffer curve. Laffer received a BA in 1963 from Yale University and an MBA in 1965 and his Ph.D. in 1971 from Stanford University. He is a member of a supply-side economics, and from 1981 to 1989 was an important member of Ronald Reagan's Economic Policy Advisory Board. Laffer became famous because of the illustration of a relationship between tax rates and tax revenue by the Laffer curve in the early 1980s to popularity. He is born under the zodiac leo, who is known for Ruling, Warmth, Generosity, Faithful, Initiative. Our collection contains 22 quotes who is written / told by Arthur. "With the shrinking of the US economy, and it's shrinking very rapidly, you not only have more money, but you also have fewer goods. That's a classic double-whammy on inflation"
"The trade deficit is the capital surplus and don't ever think of having a capital surplus as being a bad thing for our country"
"Let me just try to give you sort of the intuitive one here on the stimulus funds. If you have a two-person economy - let's imagine we have two farms, and that's the whole world, just two farms. If one of those farmers gets unemployment benefits, who do you think pays for him? Am I going way over your heads today?" "It has always amazed me how tax cuts don't work until they take effect. Mr. Obama's experience with deferred tax rate increases will be the reverse. The economy will collapse in 2011"
"And just remember, every dollar we spend on outsourcing is spent on U.S. goods or invested back in the U.S. market. That's accounting"
"What we're talking about is the price of goods, all goods, in terms of money. That has nothing to do with unemployment, except for the fact that you get fewer goods. And when you have more money and fewer goods, the amount of dollars per good goes up. It goes up because there are fewer goods and it goes up because there is more money"
"When you look at the world, everyone in the world who cares about his or her family wants to have a major portion of their assets in the United States because we are the growth country and the freedom loving country"
"I mean, everyone agrees with stress tests for banks. I mean that's clear. But banks should do that on their own. And they should worry about their own capital functioning. That's what they should do. It shouldn't be a government function"
"Sound money is the sine qua non of a prosperous society"
"Which would you rather have, capital lined up on your borders, trying to get into your country or trying to get out of your country? We are the capital magnet of this planet and we are the savior for not only people, for not only freedom, but also for capital"
"The income effects in an economy always sum to zero"
"I think the inflation prospects for the U.S. over the next five or six, seven years, are quite serious. You cannot have a bumper crop in apples without the value or the price of each apple falling. The Fed has had the largest increase in the monetary base in the history of the U.S., from colonial times to the present, times ten"
"And let the Fed sell bonds to bring bank reserves back down to required reserve levels, so we have restraint on bank lending and bank issuances of liability"
"You know, without China there is no Wal-Mart and without Wal-Mart there is no middle class and lower class prosperity in the United States"
"We are having the single worst recovery the U.S. has had since the Great Depression. I don't care how you measure it. The East Coast knows it. The West Coast knows it. North, South, old, young, everyone knows it's the worst recovery since the Great Depression"
"The truth of the matter of is that stimulus money not only doesn't stimulate; it actually reduces output"
"The minimum wage is the black teenage unemployment act. It is the guaranteed way of holding the poor, the minorities and the disenfranchised out of the mainstream is if you price their original services too high"
"People can change the volume, the location and the composition of their income, and they can do so in response to changes in government policies"
"And you can't have a prosperous economy when the government is way overspending, raising tax rates, printing too much money, over regulating and restricting free trade. It just can't be done"
"What I'm not saying is that all government spending is bad. It's not - far, far from it, but there is no free lunch, as a former colleague of mine used to say. There is no public tooth fairy. Father Christmas does not work on the Treasury staff this year. You can never bail someone out of trouble without putting someone else into trouble"
"People can also change the timing of when they earn and receive their income in response to government policies"
"Government spending is taxation. When you look at this, I've never heard of a poor person spending himself into prosperity; let alone I've never heard of a poor person taxing himself into prosperity"